“Can you tell me what the law is about motorhomes parking for several months in a car park without any facilities? The mind boggles with what they do with their waste. In El Pinet, La Marina there are sometimes as many as 50 and this reduces the width of the road as some are so wide”. Call the local police because they are parked on the streets. If we find one of these parked near the road, we can fine them, but in these cases it is the local police who have to take action on the matter. All traffic matters on the local streets of a municipality are dealt with by the Local Police. As the Guardia Civil Tráfico, we deal with major roads and the motorway networks. Firstly, they are not parked in the correct way. All vehicles have an obligation to park correctly, i.e. within the white lines of a parking space. 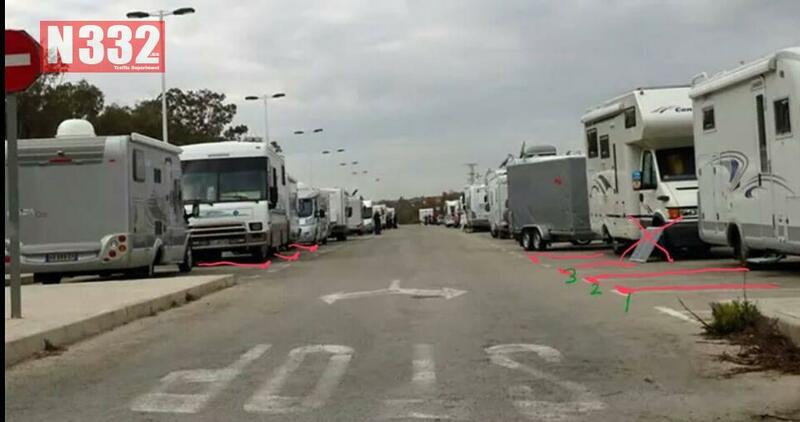 If you look at the white lines in the picture, which we have highlighted, each caravan occupies 3 parking spaces. Therefore, the Local Police can attend and fine all of the offending vehicles. The car park here is designed for cars only, which you can see from the size of the parking spaces. Secondly, caravans and campervans cannot place fixtures in the road or street. In the picture, we see a solar panel on the road, which is strictly forbidden. The same would apply for chairs, tables and any other elements like this. To make matters clearer, first of all, we have to differentiate between parking and camping. PARKING (The vehicle must be parked in a manner that respects the lines drawn on the ground as any other vehicle, locked and with the engine off). CAMPING (It is forbidden to set up camping furniture in the street). Motorhomes have a legal right to park in any place that other vehicles are allowed to, they cannot be discriminated against because of the type of vehicle that they are. Town halls do not have any powers to ban motorhomes from parking in any place if the parking is allowed for vehicles, so long as the motorhome is able to park correctly. If you see the owner of a motorhome depositing of their waste in an illegal place, call the Local Police or Guardia Civil depending on where you are. But remember that if the motorhome is parked in a correct way (parking), the current legislation allows this practice unless they take out their furniture /awnings etc and are therefore classed as camping.